'Maxwelton' was built for John Rogers Maxwell Sr. c. 1898 by William B. Tubby in Glen Cove. Maxwell was president of the Atlas Portland Cement Company (which supplied the cement for the Panama Canal) and was vice-president of the Long Island Rail Road. Most of 'Maxwelton' was razed c. 1950. The water tower also survives. The house in question - is it the house that has the oval shaped pool with the tennis court below? 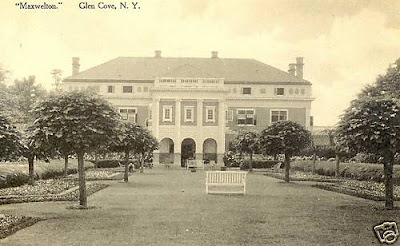 Where in Glen Cove is this house? Thank you. The muse of Guillaume Apollinaire, harbinger of surrealism, came to work here as a governess in the middle 1900s. Her name was Annie Playden. At Number 55 Red Spring Lane the original Maxwellton Carriage House and Caretakers home survives. The carriage house remains unchanged since the day it was built.